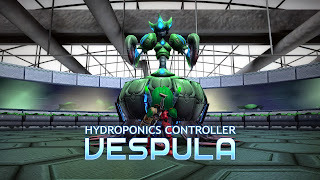 So with Vespula in the game and playing well, the next thing to tackle is the visuals. I start with the stage. 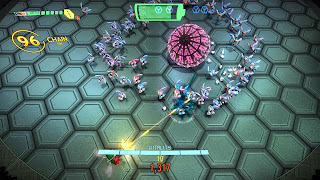 Like Embryo, Vespula faces the player in a circular arena with high walls. I want the arena to have a simple motif that reflects the zone that the player has just fought their way through to reach her. I wanted to use glass and after doing a few practice sketches decided to go with a horizontal theme, which meant the window would run continuously like a hoop around the stage, so going back to my zone two tileset I built a tall window piece. 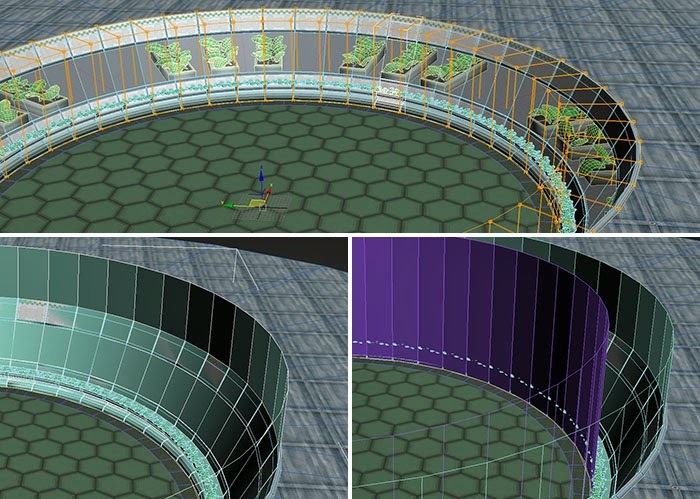 Adding the cylindrical planter (already used on Oxygen) to the window piece and using an FFD to shape it into a wedge, I duplicated it around the edge of the stage to create a continuous surface. Behind the window I added a raised white floor and some planters. It still looks a little sparse behind her, so when I get the chance I might come back and add some large pipes and a misting watering system to give it more of a nursery feel. To prepare the level for gameplay I add a simplified mesh for the collision (used for projectiles and flying enemies) and a vertical surface for the movement blocker. 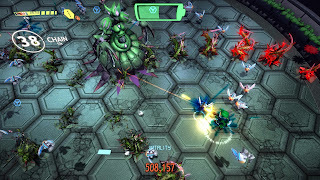 (used by the player / non flying enemies to define where they can't travel) The collision mesh has to closely follow the visual mesh or objects and bullets will appear to hit empty air, but it's okay if it skips over smaller nooks and crannies. 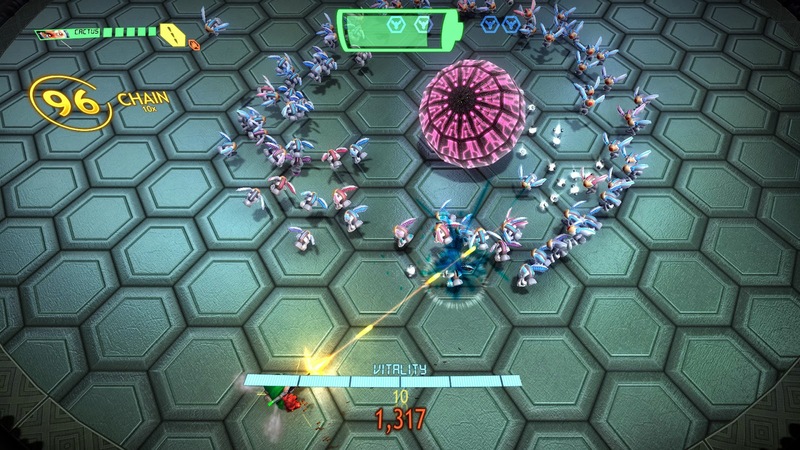 My character texturing is somewhat slapdash but I have been developing a technique for the robots. I start with base colours, then draw lines everywhere. Embryo was meant to look heavy duty, like a piece of construction equipment. His panels were access points and manufacturing seams. 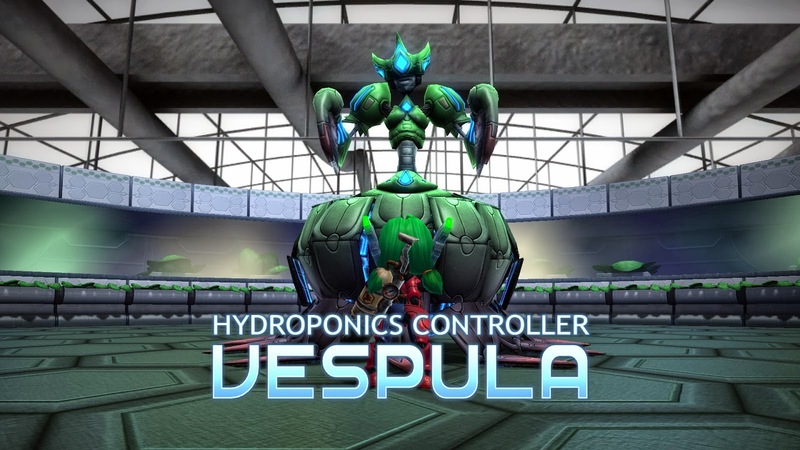 By comparison, Vespula is sleeker, more organic. While she's still built out of components, they should be as much about musculature as as they are about her robotic nature. if you get caught scribbling on things at school, claim you're preparing for a career as a texture artist, it'll be a half truth! 3DSMAX is reading the PSD file so I'm drawing lines, switching to see how they look on model then switching back. The logic is lines either trace features of the anatomy like the ribcage or spine, or have a mecha inspiration. For the dress, originally I wanted panels that evoked a feeling of cloth folds or Victorian era patchwork, but it never felt right, so I went with the circle and scooped line motif that linked the panels together. For the inside of the dress, I wanted the colour to be different (so she visually 'armoured up' when she turns into a ball) and have a circuitry motif to the indicator lights. With the panel work in place, I start shading. For a robot like Vespula, I'm working entirely with a soft brush. Painting in a little bit of shadow, but mostly suggesting curvature and volume. I select the lines, expand and mask them and then paint in lights and darks to suggest bevelled panel edges. 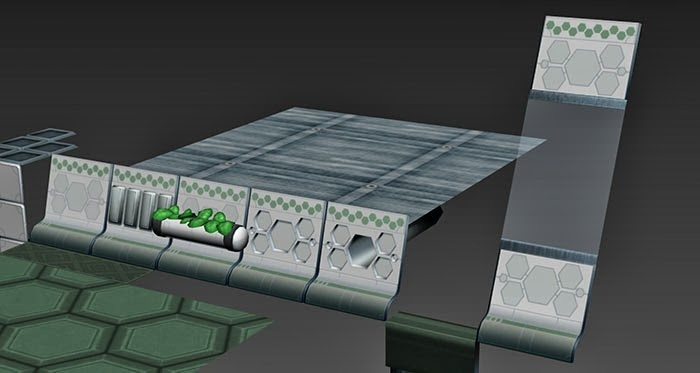 This is a style of texturing that was more popular during the height of PS2, modern material pipelines tend to avoid baking any lighting information into colour maps, but helps give the game that modern-retro look and I like it. I work my way across the texture in this fashion until I've done all the panel sections. To contrast her clean body, I wanted her shears to look a bit nastier, so I worked in some photo reference and used motion blurred noise to add streak marks to the cutting edge. The body work was looking good but very monochromatic, so I added a gentle gradient that picked up the dress and the edge of her shears, and went through tweaking the colours of some of the panels. The red tips were supposed to continue the flower theme as well as drawing attention to the parts of her body that inflict damage. 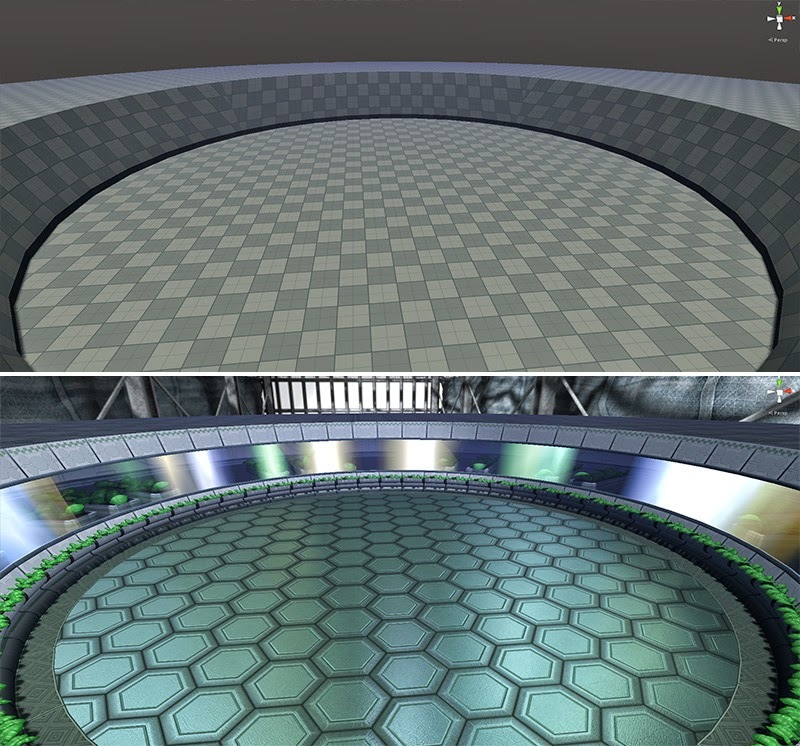 Finally I increased the vibrancy of the green so she'd contrast with the floor of the stage better (and so the gradient would be more apparent) and broke everything into separate maps so I could assemble the material inside Unity. And with that Vespula's pretty much done! Of course she's not done done, there's boss dialogue to finalise, effects to improve, visual improvements to make to the stage, sound effects and voice barks to add, but for the purpose of this Making Of feature, that's a boss from start to finish. It's been a bit more interrupted than I would have liked, but I hope you found it interesting! Here's a few shots of how she looks from the latest Early Access build. 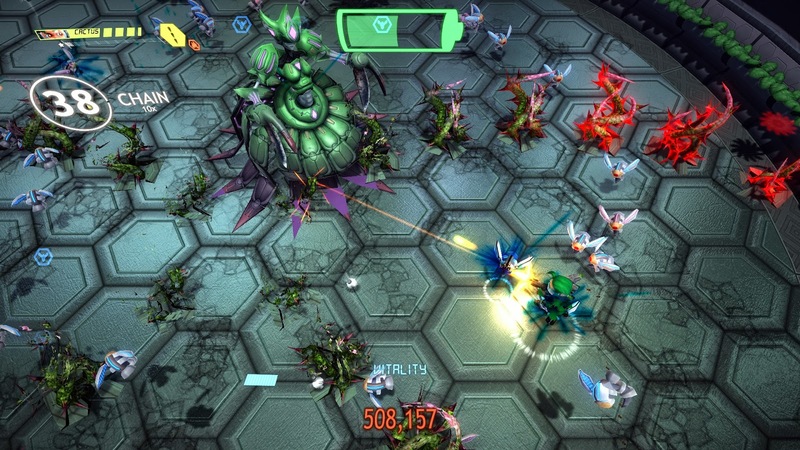 This is really lookin' great, love the 2000-era Dreamcast look, like Planet Harriers or Cannon Spike. This comes out in November, right?